Fitment Note: These Part# 781-F a-arms do not have mounts for factory style coil springs. They are designed to be used with front coil over kits. 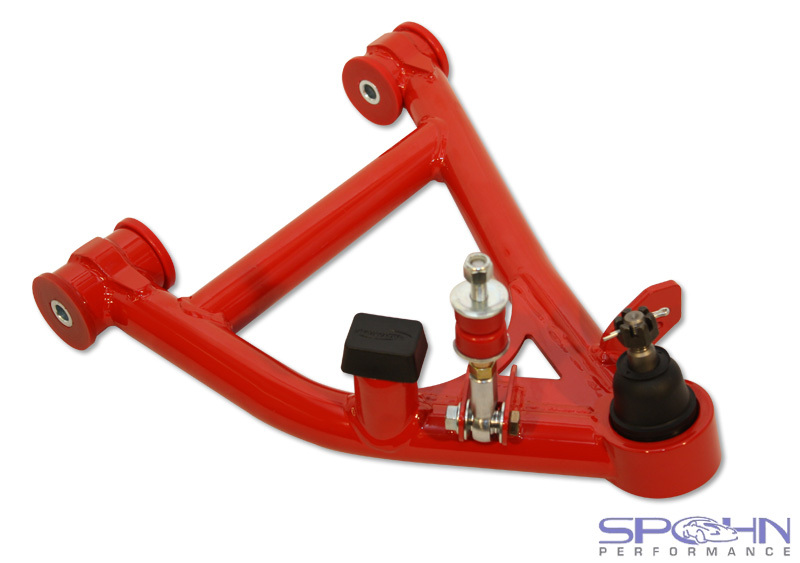 In November of 2014 we released these RRx Series™ tubular front lower a-arms for the 1982-1992 GM F-Body Camaro and Firebird that set a higher standard of performance and quality. They are truely the new standard of comparison. All of our RRx Series™ tubular a-arms are designed using aerospace level technology and design tools. First we create a 3D scan of the factory a-arm using a FARO® ScanArm™ with a 3D laser scanning attachment. Then we use that 3D model of the factory a-arm as our foundation for creating a tubular version inside of our Solidworks® 3D design software. After we're done designing the a-arm in Solidworks®, we then use that 3D data to design the jig that we will use to build the a-arms. The jig parts are then CNC laser cut and formed on an 8 axis CNC press brake. The final result is dimensional accuracy to within .005"! When we designed our RRx Series™ tubular front lower control arms, we had two goals in mind. One was to provide the performance capabilities needed for the toughest race tracks, the second was to provide the strength and durability required for the demands of a daily driven vehicle. We're proud to say that we have accomplished both. If you're looking for the strongest, most rigid, and best performing front lower a-arms for the third generation GM F-Body Camaro and Firebird, you just found them! Our RRx Series™ front control arms are a true "A" arm rather than a "V" arm. This increases the arm's rigidity and equalizes the forces delivered in to the k-member. These a-arms are gusseted at the ball joint, and feature 100% TIG welded CNC laser cut and formed 3/16" steel bushing tube gussets for maximum strength and durability. 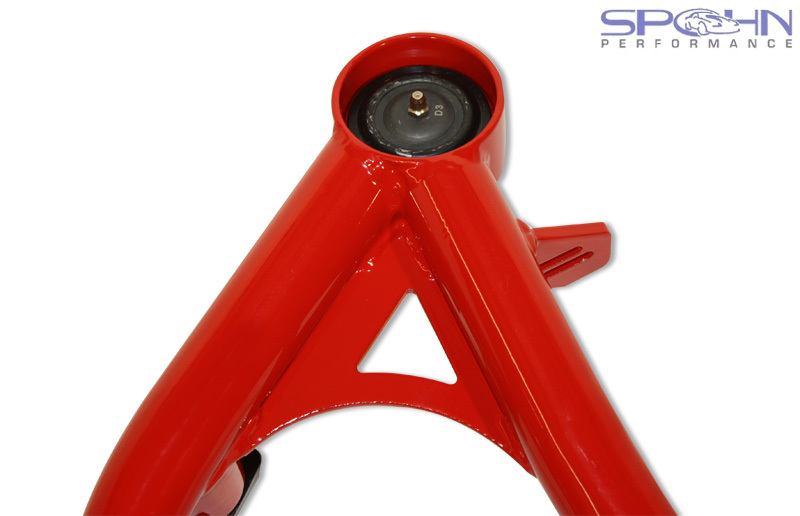 These a-arms come equipped with steering stops welded in place that maintain the factory steering radius as well as polyurethane bump stops that maintain the same suspension travel as the factory a-arms. They decrease overall weight, and more importantly "unsprung" weight. 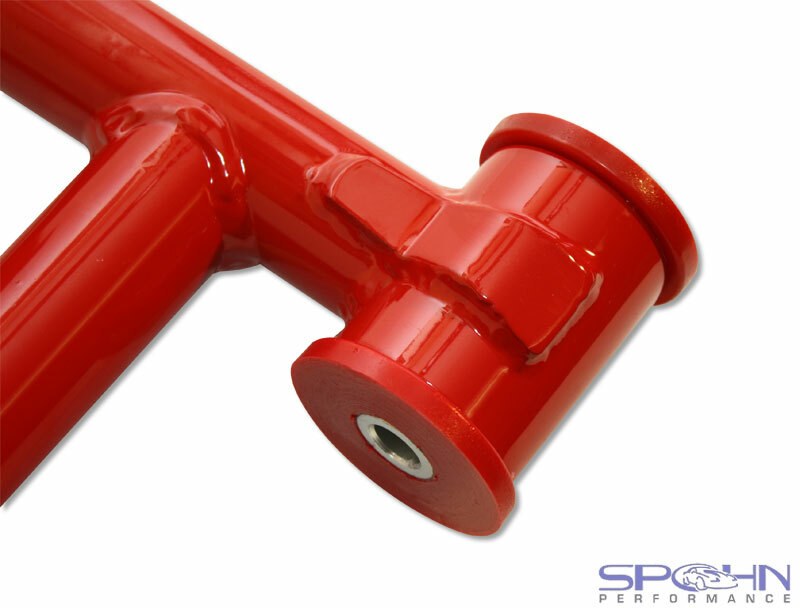 Finally, we include new spherical front sway bar end links. 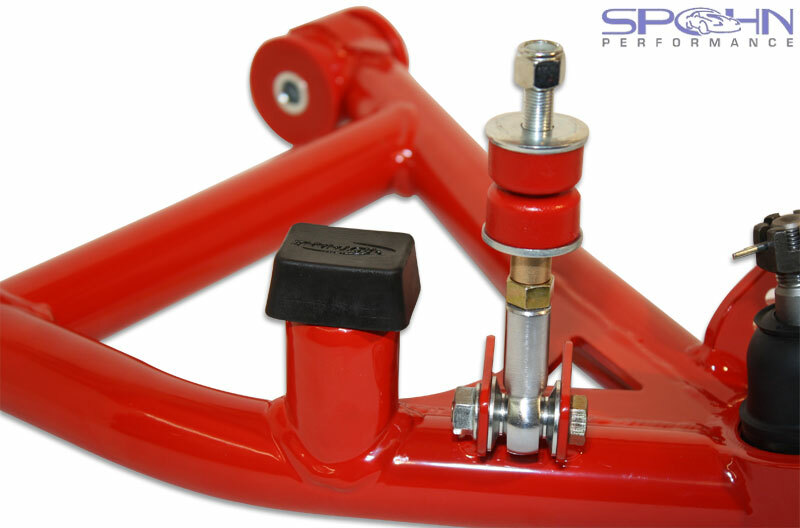 Our front sway bar end links connect to the a-arm with a self-lubricating Teflon® lined chrome moly spherical joint that provides a bind-free connection for maximum handling performance. 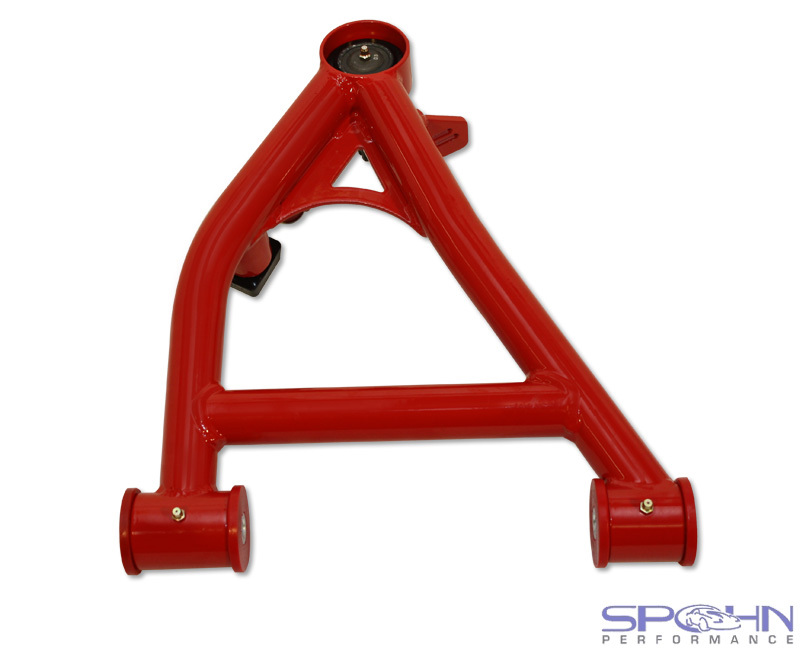 The top of the end link connects to the front sway bar with low deflection polyurethane bushings. 1.50" x .120" wall DOM tubing. Ball joint cups are CNC machined from 2.75" x .375" wall DOM tubing. Precision greaseable ball joints (installed) with heavy duty Neoprene boots. 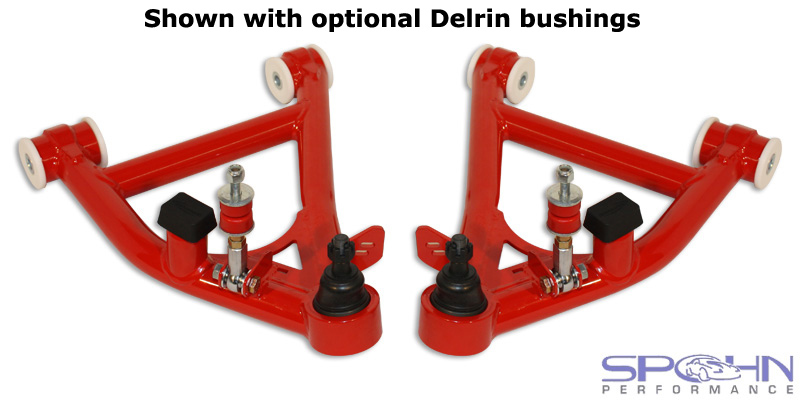 Fluted polyurethane bushings with grease fittings (Delrin® bushings are optional). 100% TIG welded CNC laser cut and formed 3/16" steel bushing tube gussets. 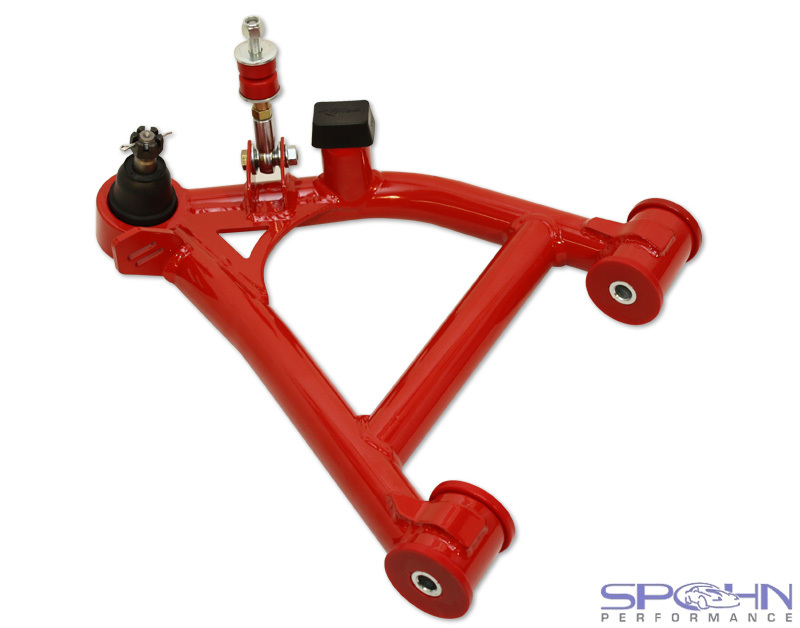 Includes bind-free spherical front sway bar end links with Teflon® self-lubricating race and polyurethane bushings for the upper connection. 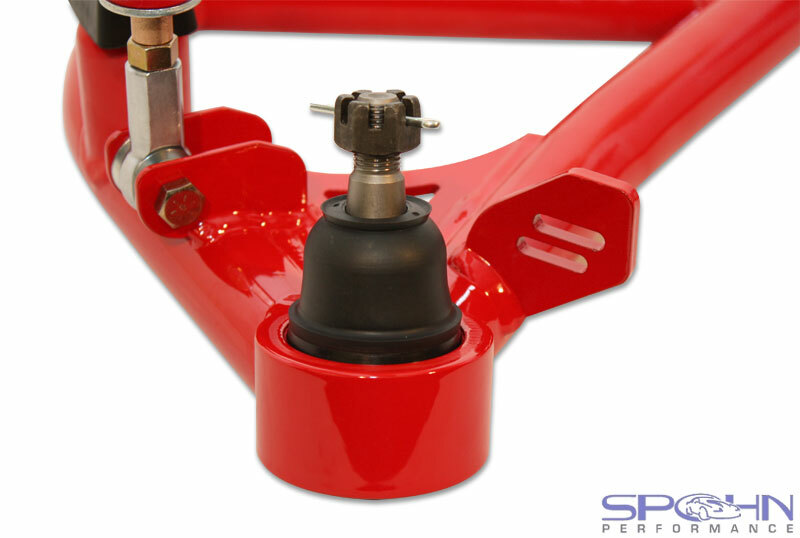 Heavy-duty steering stops are installed to maintain the factory steering radius. Includes polyurethane bump stops that maintain the factory suspension travel. Ship fully assembled and ready to install. Major decrease in unsprung weight. They are stronger, yet lighter than stock. Available powder coated in your choice of the above colors for a brilliant and durable finish. 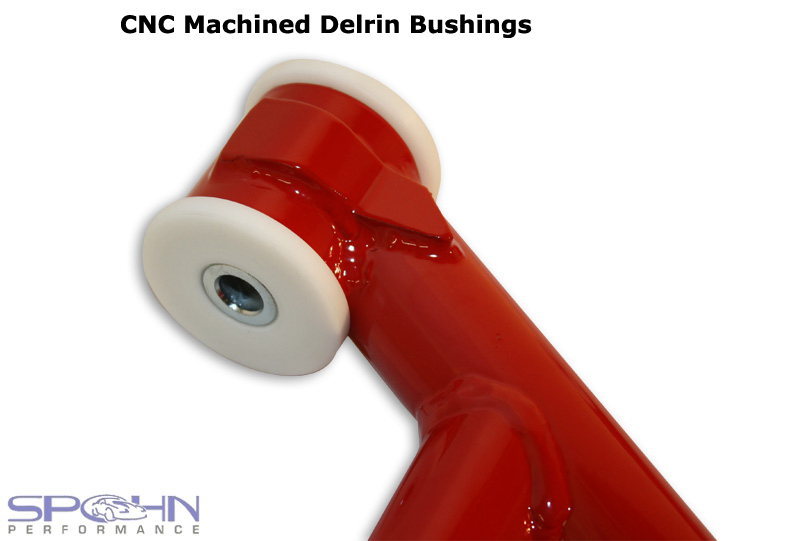 Delrin® Bushings Option: These a-arms are available with CNC machined Delrin® bushings. For the serious Road Race or AutoX car that demands a zero deflection bushing. They are a bit harsher on the street (NVH).